The findings are changing the whole picture of early life in North America and providing new opportunities for today's communities to connect with the past. Dozens of Indian mounds once dotted the Yalobusha River valley and the area around Holcomb, many unfortunately now vanished under farm fields. But their memory is fascinating window into history. Nothing is known of the purpose of these mounds, whether they had religious significance or ceremonial function. No human burials were found in them. But they show that ancient people who lived in this land had the capability to plan and organize large-scale construction projects thousands of years ago. At first, early hunter-gatherer people moved with the seasons and must have returned in spring and summer to river valleys such as the Yalobusha to feast on fish and mussels, edible plants and woodland game. A climate change in the eastern part of North America 7,000 to 5,000 years ago had made these valleys much richer sources of food, and this may have attracted the hunter-gatherers to linger throughout the year. Trading networks, then agriculture developed. As communities gained surplus food and trading wealth, they could afford to devote time and energy to more complex "public works" projects. The mounds may have been a way of defining territory or celebrating victories. Structures may have been built on top to avoid flooding. The coming of white explorers changed this world forever. Robert Ferguson, tribal historian of the Mississippi Choctaws, writes: "The early European explorers came to plunder. To plunder they conquered. To assure conquest, they established fortress and settlement. ... A constant ally of the early settlers was epidemic disease. ... The story was everywhere the same: enormous reductions in population. ... It is important to remember when reading accounts of early observers of the southern Indians, that what they saw and reported were not the pristine culture of pre-contact times, but the cultures constructed or reconstructed after pestilence had ridden its fatal, disruptive course." Nevertheless, throughout the South, intertribal and intratribal customs survived. Standards governed behavior between individuals and groups. There were established limits of tribal lands, trade routes and trading languages. Some tribes specialized in producing goods, others in hunting or farming. Travel was widespread, and even faraway tribes were known. The Choctaw Nation, a stable agrarian society with a wide trading network, included the area that now is Holcomb. The name Choctaw means separation, and referred to the ancient separation of the Choctaw and Chickasaw tribes. Henry Heggie, in "Indians and Pioneers of Old Eliot," writes: "As the Thirteen Colonies developed on the eastern American coast, those with unimpeded western borders pressed their territorial claims farther and farther into Indian lands. The lands of the Choctaws gradually were claimed by the fledgling state of Georgia, which drew its western border along the Mississippi River. "Conflicts over these land claims quickly arose between Georgia and the new Continental Congress. ... An act of Congress in 1798 included an agreement that the western territory, which included the Choctaws' homeland, should be reserved for a separate state and be admitted as such into the Union as soon as the population reached 60,000 inhabitants. "... 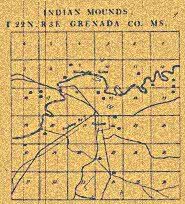 In ceding the territory to the United States, Georgia recognized these Indian claims and mandated in the cession agreement that vacant land could be sold only after Indian title had been exhausted. 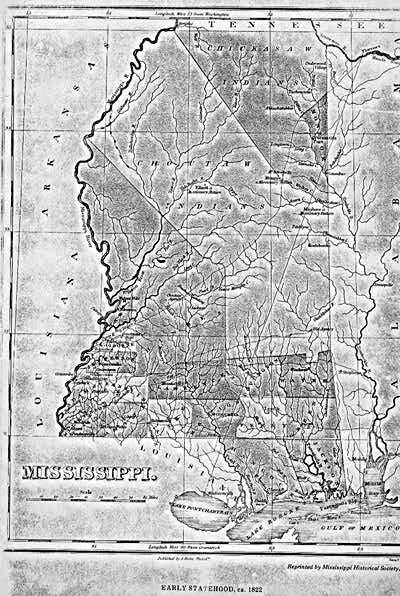 "In 1804, the land ceded by Georgia became the Mississippi Territory, and in March 1817, Congress authorized the western portion of the Mississippi Territory to begin to organize for statehood. ... The Choctaws began to feel growing pressure on their lands. Mississippi was made a state on Dec. 10, 1817." According to the Mississippi Band of Choctaws, "between 1801 and 1830, the Choctaw Nation ceded to the United States government over 25 million acres of land and agreed to relocate the tribal government to the Indian Territory, now Oklahoma. Several thousand Choctaws, through love of their ancestral homeland and pride in their culture, elected to stay in Mississippi and become citizens of the United States." In one of the few direct descriptions of Choctaw life in the area that now is Holcomb, Henry Sale Halbert (1837-1916), a teacher among the Mississippi Choctaws, describes the founding of the Protestant Eliot Mission Station, about a mile south of the present town, in 1818. From a joint Presbyterian-Congregationalist outpost in the Cherokee Nation near Chattanooga, Tennessee, the Rev. Cyrus Kingsbury and Mr. and Mrs. Loring Williams set out in a flat-bottomed boat down the Tennessee River, taking a wagon with them on the boat and sending horses overland along the river to Colbert's Ferry. From there, they sent most of their goods on by water along the Tennessee, Mississippi and Yazoo rivers and then up the Yalobusha River. They proceeded by wagon down the Natchez Trace as far as possible, then turned off and "set out with the wagon through the pathless woods for the settlement on the Yalobusha River ... and after much trouble in getting the wagon through the cane swamps and thickets," arrived at the settlement in June 1818. The Yalobusha settlement was controlled by Chief Isaac Perry, whose mother was Choctaw and whose father, Hardy Perry, was one of the first white traders among the Choctaws. "The missionaries were most hospitably received," Halbert writes, "... and Captain Perry offered them a house in his yard until they could put up buildings of their own." "A suitable place was finally selected for the mission station. It was a slight plateau covered with lofty trees and dotted here and there with ancient mounds, showing that it had once been the habitation of prehistoric men." The station was name "Eliot" in honor of John Eliot, an English Puritan born in 1604 who had emigrated to America to educate the Indians of Massachusetts. The little station grew with the arrival of more missionaries and the building of homes, a church and a school. A doctor, a carpenter and blacksmith also arrived and "a blacksmith shop, granary and other buildings were erected, and soon furniture, wagons and all kinds of agricultural implements were made at the mission." For more than 20 years, Eliot Mission was a center for Choctaw education. But in 1830, the infamous Treaty of Dancing Rabbit Creek began the removal of the Choctaws from their eastern lands, and by 1833 the mission had closed. Only a few Choctaws, including Isaac Perry, managed to retain a foothold in their homeland, but geographical names recall their era. Isaac Perry was granted as a "reservation" Section 22, Township 22 north, Range 3 east in what is now Grenada County. Seventy years later, the town of Holcomb was established on part of that section. In a historic 1997 Thanksgiving week ceremony, Mississippi signed a historic pact recognizing "the sovereignty of the Mississippi Band of Choctaw Indians." The agreement pledges a new spirit of respect and cooperation between the state and tribal governments. The agreement makes the state the third (after New Mexico and Oregon) to sign such an agreement with an Indian tribe.